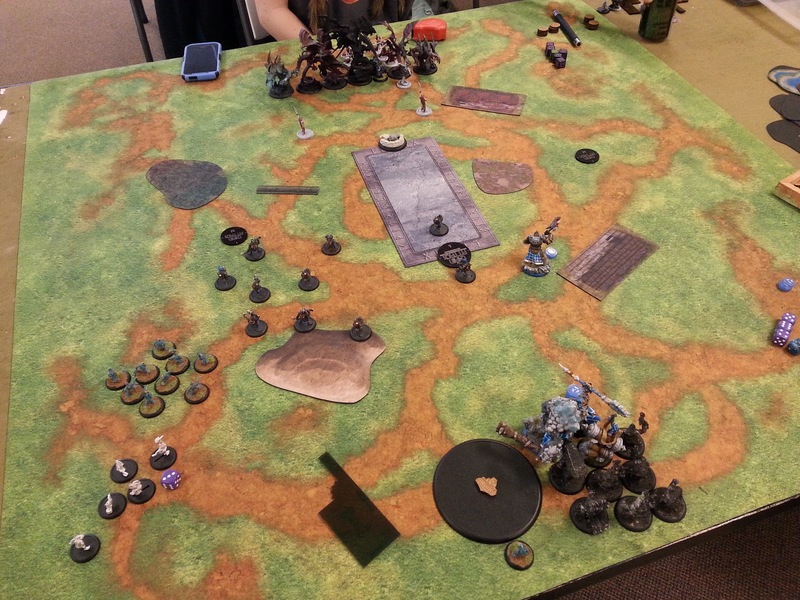 Dice of the First Degree: Vayl2 (Legion) vs. Doomshaper3 (Trolls) x2. Vayl2 (Legion) vs. Doomshaper3 (Trolls) x2. It's been a weird month guys, but I've got some batreps at least. This is the first non-beta scenario I've played in a month and a half, so I can use the batreps. The Objectives, however, are in beta, but because they held no significant factor on the game, whatsoever, I can share the game with you. For all intents and purposes, the objectives are SR2014 objectives that do nothing. Still playing Doomshaper3. I've played this legion player several times, and his current pairing is Thags1 w/Blightbringer and 2x units of Warspears w/UA, and his other list is Vayl2. He's tried the Thags1 list into my twice now and I've beaten it both times, though they've had the opportunity to go either way. So he's trying Vayl2 into Doomy3 again. We burn through the first game, and reset and go again, so I've got two batreps here, same lists, same scenario. My Doomshaper3 list is unchanged, though I forgot my Mountain King so the large black base is the proxy. It's been a busy month. This is a Tier 3 list. Vayl2 is playing tier as well. My opponent wants to play Recon so we throw the terrain together, roll off and I win the roll with a Seven thanks to tier. Deployment is pretty simple. I only have a few models. Mountain King is deployed left of the objective because there's a house on the right and more room to move on the left and that's the only important thing there. 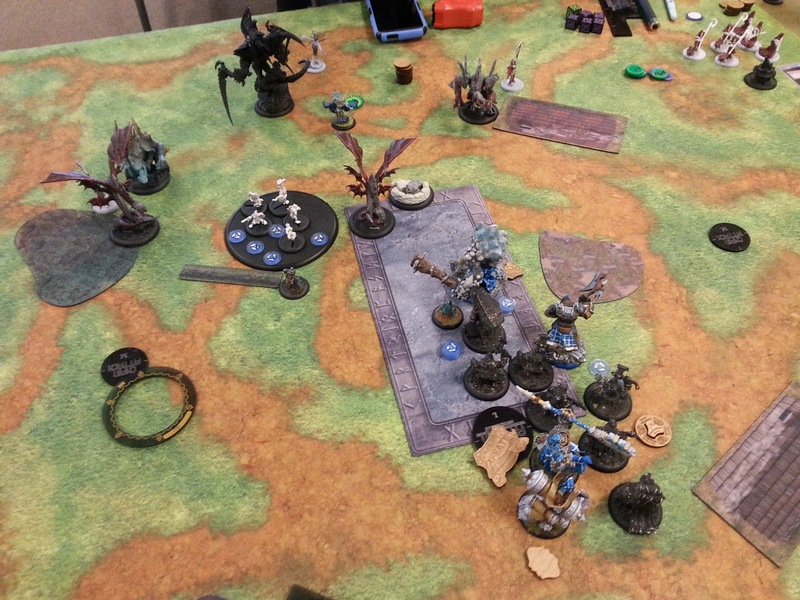 This picture is after the Axer has rushed MtK and charged, and the Burrowers have run. Mountain King runs. Doomshaper puts down Implacability, rushes Mulg, dumps the rest to the stone and charges the Mountain King. KSB pops aura and runs. The one whelp I deployed runs up too. My opponent decides that he thinks he can get an Angelius into the King this turn. So a Ravagore shoots a Burrower and kills. The Seraph animuses and Slipstreams the Angelius up a bit and moves to my left. The Scythean pushes the Angel up. The other Ravagore runs. Vayl2 activates, puts Refuge on the Angel that's been pushed, puts Admonition on the other and that's all I remember that's pertinent. 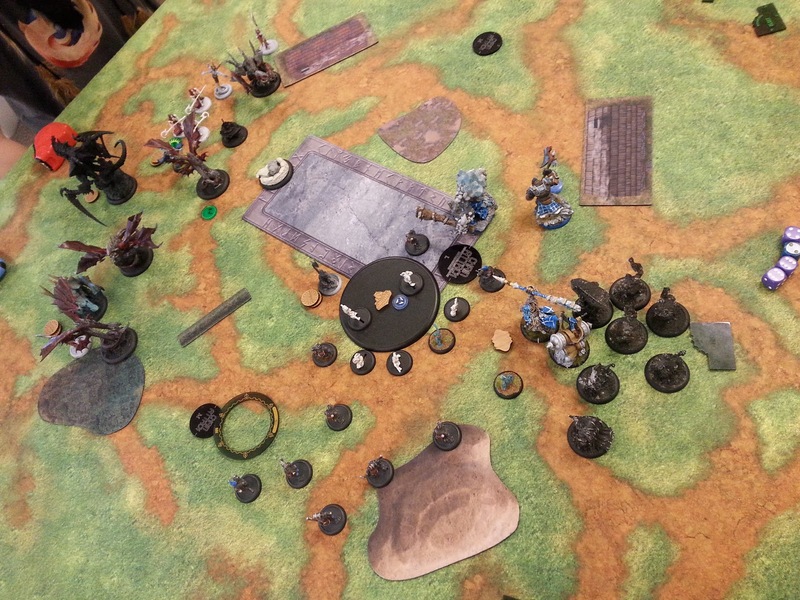 The Angelius charges the Mountain King, armor pierces at dice even (19 rounded to 20, divided in half to 10 for armor piercing, +2 ARM from tier, +2 ARM from stone), and does seven or eight damage. Buys an attack, hits him again. It does about 15 damage to the King, leaving four whelps on the ground. It refuges off to my left. The pot dudes attack themselves and spawn a stinger which runs up to my Mountain King and is just a pest in general. It's feat turn for sure, so the Burrowers burrow. This is probably the most thinking for this game, is running the Burrowers first turn or burrowing. I like them to be underground for the feat so that there's really nothing for the opponent to do. They help to either stall an alpha, or be a pain on the post-feat turn. In this case, that's what I want, the post-feat turn speedblock. So they burrow. Doomshaper moves up a little, feats, does Admonition on Mulg, casts Implacability and puts 1 on the stone. Mulg walks up, murders the Stinger and goads away. The Axer moves up, rushes the Mountain King. The Mountain King activates, rolls 5d3 to heal (Four whelps, 1 hyper regen from Doomy3) and rolls five fives, healing 15 damage, bringing him to full. He then assaults into the Seraph. The admonitioned Angel wanders past me into my back arc. It takes four fury but I remove the seraph (Missed an attack and rolled terrible damage on another, leaving him on two boxes) and have a fury left. I killshot the pot, hit, boost damage and remove it from the board, along with the unit. The Mountain King has consistently removed that pot from the game. It's pretty funny. To me. The stone pops aura and runs to support the King and get +2 ARM out there. So it's go time. 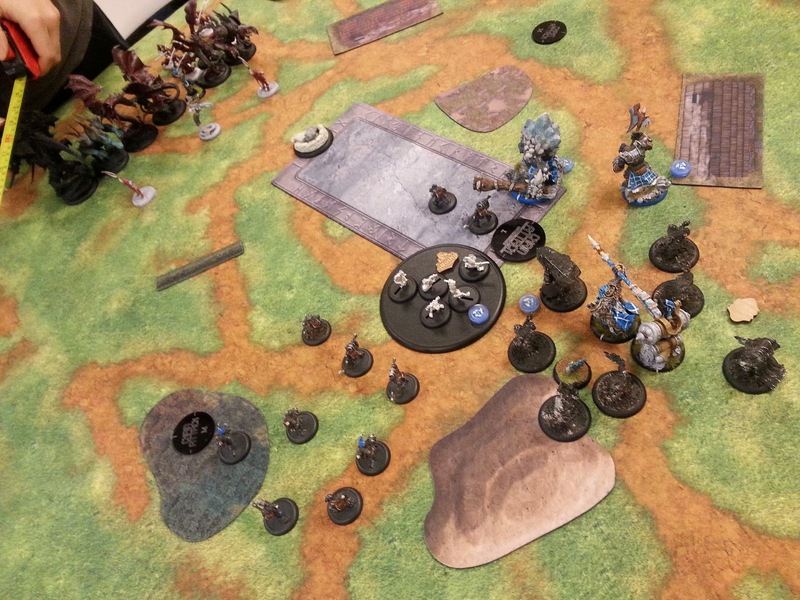 The back right Ravagore aims, puts a shot into the stone unit and kills three models, including the stone bearer who self sacs to the one survivor in the group. The angel that admonitioned walks up and kills the bearer himself, putting the Mountain King down to ARM19. Don't remember how, and refuges the other Angel I think. It moves in, hits the Mountain King some but not a lot and backs of. The Scythean goes all in but really does very little. Vayl activates and manages to get Admonition back on the angel in the zone, oblits some whelps off and the Ravagore gets some too. That's turn. Shepherds do some fury things but yeah. 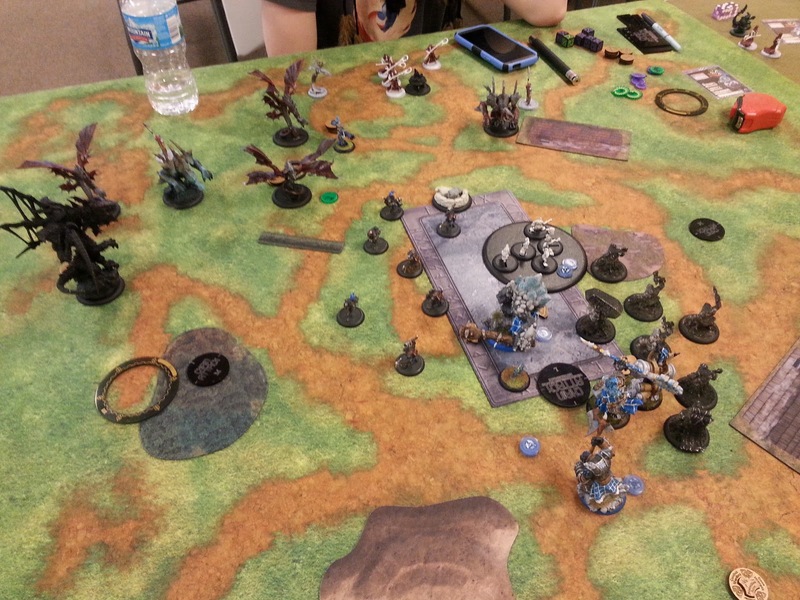 Burrowers come up around the Angel in the zone. Mountain King eats a whelp to get rid of fury and Doomshaper takes everything back in and upkeeps Admonition. The stone moves first to get stuff set up and open lanes, and in my idiocy, I run the KSB UA within 6 of the Angelius, which admos out of the burrowers, so four of them lose the back arc bonus. Very dumb move on my part. 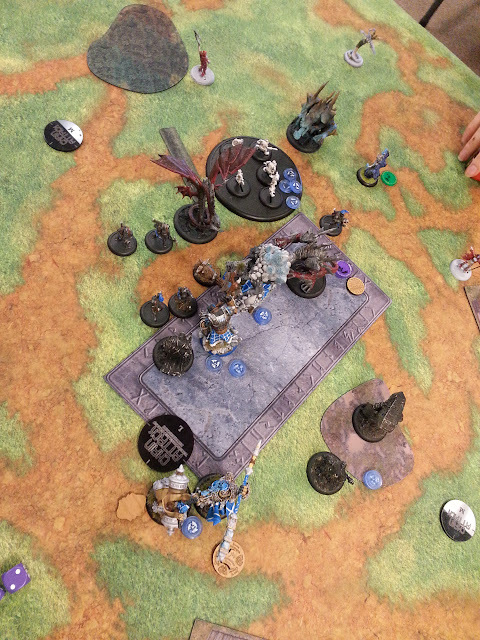 Doomshaper goes ahead and moves into the zone, casts Implacability, and puts Rush on Mulg I think. Maybe. He camps three fury though. The scroll does the "Signs and Portents" thing for warrior models and the Burrowers shuffle over unfortunately. Of the six of them, three hit with their POW8s and do nearly nothing, and only 1 POW14 hits, doing three or four damage. The other burrowers shoot at the objective and leave it on seven. The Axer charges in, boosts to hit and does seven or eight damage. Buy an attack, hits (rolling hard 8s) and then boosts damage, leaving the Angel still kicking. Originally Mulg was going to go into the Ravagore in the upper right, but the Angel is more important. He moves up to the objective, hits it, finishes it, goads back to the Angel and kills it. The Mountain King removes the Scythean with ease. With the Objective gone and Doomshaper in the zone, I go to three CP. Not a lot anyone can do. 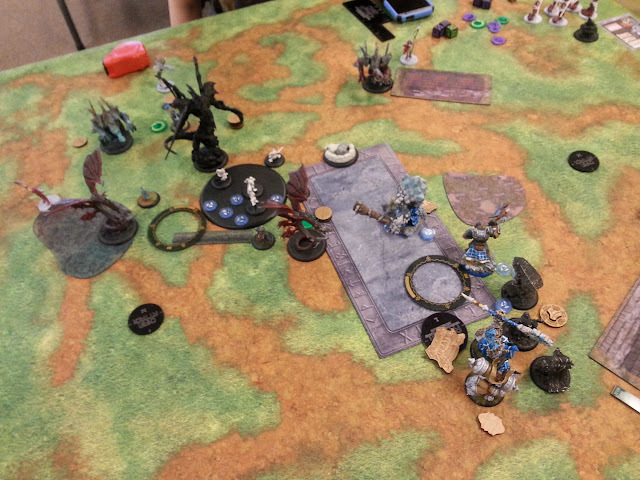 Vayl2 moves in, feat, oblits Mulg twice, does some damage, and kills whelps that spawn with her occulus. She's also just out of range of the KSB dude, so she can't get the +2 ARM gone. She does refuge the Ravagore though. The Ravagore charges, but is just out, failing it. The Angel goes in on Mulg, but only does about half damage, removing his spirit. The second Ravagore goes in on the Mountain King but at dice -5, does very little. Pretty simple after that. 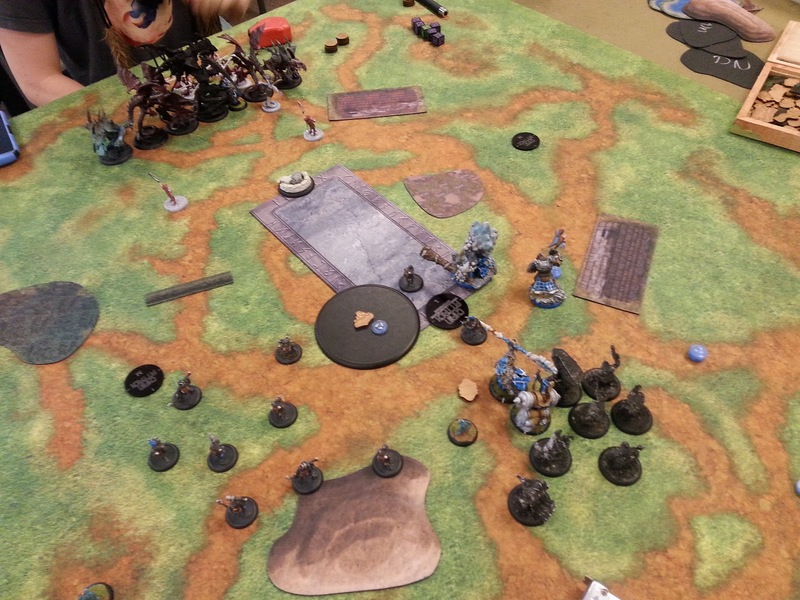 Doomshaper pulls fury off of Mulg and the Axer while the Mountain King eats a whelp. 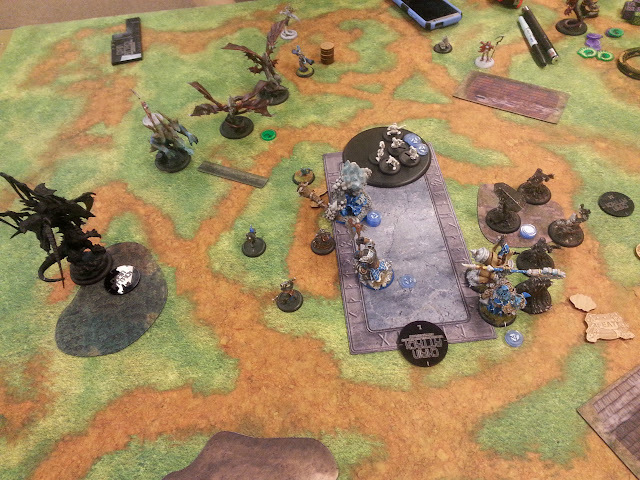 Mulg heals 3 with the Hyper Regen and trivially kills the Ravagore, scoring the last two CP needed to win the game. 2. I've played against Vayl2 tiers before, and had a lot more trouble against them. I think normally they have the Blackfrost Shard though, and this guy doesn't have that. Until then, a PS17 scythean doesn't scare me too much. 3. I can't believe I forgot about Admonition. I even have that spell. Next game. Same lists, same Scenario. I even win the rolloff again. We deploy exactly the same. First turn goes exactly the same. His turn is vastly different however. Everything essentially runs to the left with an Angel, Seraph and Ravagore putting shots into the Burrowers, killing three, and one bad drift way out to left field. When it's all said and done, everything is way back and way left trying to flank hard and the Seraph has Admonition, really the only thing in Charge range. There's one Ravagore tucked into the building on the right, but that's it. The Pot tries to kill enough of it's own models to spawn something, but no luck. I decide that I can stay out of charge range of most of the things, so the Burrowers don't burrow, but run up the left flank and tarpit . The KSB pushes right and up into the tall grass, pops Aura. The Axer moves left and back a little, trying to protect the extreme left flank, Rushes the Mountain King. The Mountain king walks forward seven inches with Rush, boosts to hit the Ravagore on the right, hits and boosts damage doing seven or so. Mulg walks up. Nothing crazy. 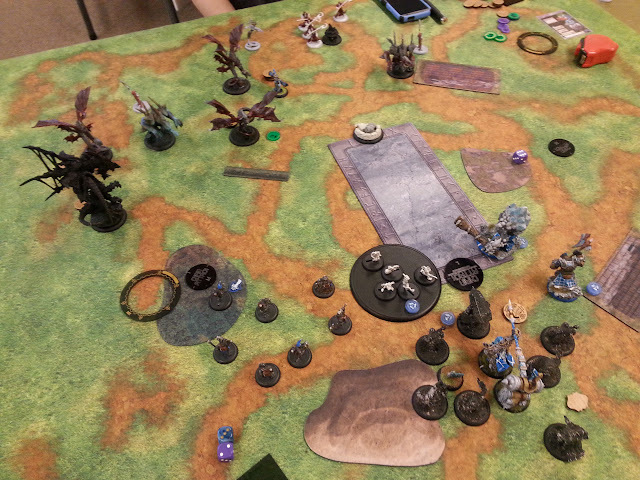 Doomshaper moves to the right, puts admonition on Mulg, loads the stone a bit and camps three. So. Vayl2 upkeeps admonition. Seraph aims and shoots two burrowers, one toughs, shoots it again and kills it. Ravagore on the right charges in and does some damage. Mountain King whelps mostly to the back because I want to heal, and I expect Vayl2 to oblit and clear them if I place them in front. 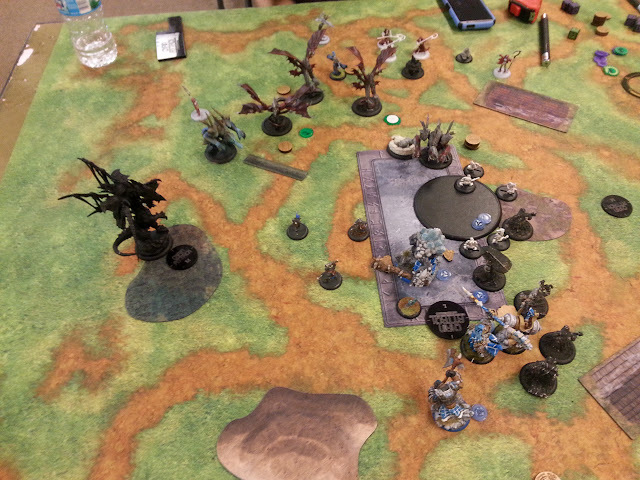 Vayl2 activates, shoots another burrower in the way, puts refuge on an Angel and camps. Burrowers fail CMD. The Angel charges in, armor pierces decently, then overtakes around and kills more whelps. Then it refuges away behind the objective. Mountain King is about half health. The other Angel runs up a bit, nothing crazy, the Scythean shuffles in somewhat, trying to force Mulg to get Rush if he's going to come. The last Ravagore puts a shot into a whelp near the King on the back side, but misses and drifts onto 3 KSB dudes and kills them. The pot manages to kill one more guy and pops a shredder when puts spiny growth on Vayl. So, definitely Feat turn this time. D3 upeeks admonition and pulls in fury. Stones shuffle into the tall grass and pop aura. 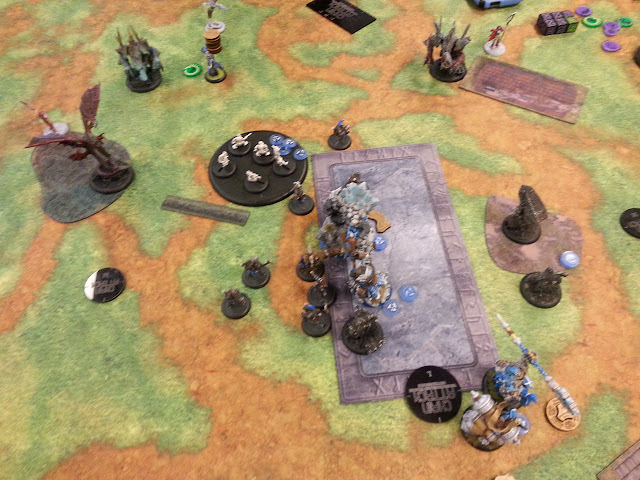 Doomshaper moves into the zone, casts Implacability, loads another onto the stone and puts Rush on Mulg. Then he feats. Mulg walks into the objective, hits with his fist, then the club and kills it. Then he buys into the Ravagore. He kills it in four attacks and goads back out of the way. The Mountain King assaults the Angel hiding behind the objective. The assault shot misses both the Angel and Vayl. The charge attack hits though and cranks damage. The second initial misses. Third attack hits, fourth attack hits and I boost damage to finish the angel. With Killshot, I target the pot, hit needing a 5 and boost damage, killing it and removing it from the table. Axer runs to my left and tries to block some more of the zone. I go to 3 CP. There's not much he can do. Vayl2 upkeeps admo, because why not. The Angelius gets spiny growth from the shredder. Vayl activates, put refuge on the Angel, moves back and tries to shoot the KSB but since he's trying to camp, he can't roll the 7 he needs because of concealment. The KSB stays. He does Icy grip the Mountain King though. 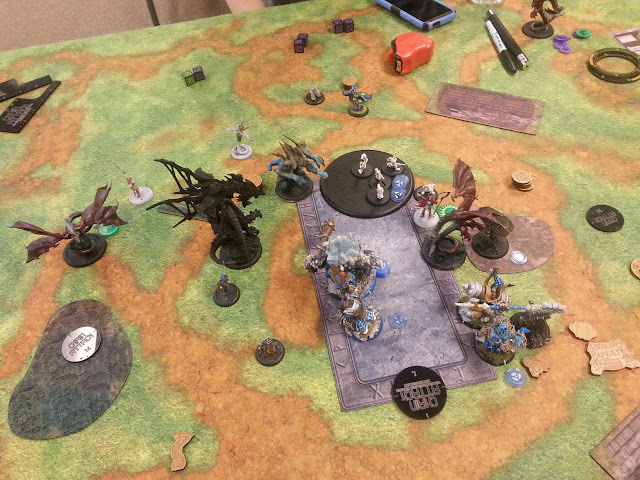 Seraph shoots the whelp behind the wall and tries to slipstream the Scythean but is just out. The Angel charges in, does a little to the King but not much. Enough to whelp once. It then refuges into the zone behind most of the stuff. Ravagore charges in, does next to nothing. Scythean charges mulg, Mulg admonitions because Vayl2 didn't Purify. Scythean instead kills Burrowers. Shepherd runs into the zone. Doomshaper pulls in fury, leaves one on the Axer which frenzies and does some damage to Mulg. Not much. Mountain King eats a whelp to get rid of his. Stone pops aura for +1 STR. Doomshaper charges the Angel, and the scroll bearer does the Signs and Portents thing. Doomshaper boosts a Repudiate, hits and removes Spiny Growth. Then he hits, crits (pointless against the Angelius) and does eight or nine damage on his own. Casts Implacability because why not. Mountain king can't sweep because of Icy grip, but he only needs sixes to hit the Scythean, so he goes for it. He kills it with 2 fury to spare, buys and boosts a hit into the Shepherd and kills it. Mulg walks into the Angel, needing sevens to hit. Four or five attacks later, it's done, dead, and I score the last 2 CP needed. 1. This game was more one-sided than the last one. Being able to start scoring on my feat turn means I go to 3CP, he can't clear me out, remove any key models, and I get to finish off what's in the zone next turn. It's pretty bad for him. Flanking hard had some benefits, but allowing me to position back and dictate when I feat was really bad. He needs to be able to keep enough of his army alive past the feat turn to remove either Mulg or the Mountain King. If I go first, I can't score on turn 2, but I probably have to feat because of my position on the board. So I'll score 3 on turn 3, but the feat is down. If he's managed not to lose his heavy hitter(s), he counterpunches bottom of 3 and removes Mulg or the Mountain King and fills the zone, which he can do very easily with Refuge. Now I have to clear the zone with just whatever's left. With the number of beasts Vayl2 brings with her and the ability to Refuge them back trivially, she can really manage to only feed me one a turn. That means she feeds the Seraph and Ravagores into the machine, saving the Angels and Scythean for the counterpunch on turn 3. None of that happened in this game. 2. No damage buff really hurts. I think I might see the Blackfrost in the future. 3. Recon is Doomshaper territory anyways. Unlike some of the other scenarios, Recon encourages a brick, and really rewards the good brick troll lists. Vayl2 can afford to spread out and play things like Incursion and Outflank, and Doomshaper3 really doesn't want to. Recon though, man, I love that Scenario with Doomshaper. So, that's the batreps. Hopefully they're some good information with the Doomshaper3/Mountain King combo. Feel free to comment and critique. It's a good list JD, and your write up is very good. Thx for taking the effort to do this. I found it very hard to deal with but would like to play it a few more times to get the Hag of what you do some more. From a legion standpoint we usually don't have the beast numbers out ride out the very impressive Doomie 3 feat turn. You would have to stick some thing out there to be hard to kill then countter attack later. Skorne might have more of a chance with Tibbers and D-Ward, but legion does not have anything like that.